Some musicians get a bad rap for being pretentious, self-centered, and generally bad people. And then you encounter an entity like Rabbit Rabbit who, in regards to their quirky moniker, explain that “Rabbit Rabbit” is a tradition in New England folklore where if you utter those words on the first day of the month, you will be granted good fortune. So for a band to assure fans, non-fans and music reviewers alike that a good month’s fortune awaits just by coming into contact with their playful name, it certainly feels like a breath of fresh air. Rabbit Rabbit is the brain child of instrumentalists Carla Kihlstedt and Matthias Bossi and boasts a high, if playful concept: A subscription-style “service” where each month a new song debuts with voracious linear notes, films, photos and whatever else they want to throw in. 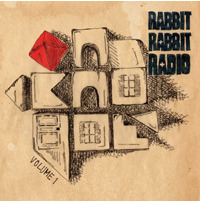 Rabbit Rabbit Radio Volume One is the accumulated result of the first year of this process: eleven songs of wide-ranging moods, stunning dynamics and excellent musicianship. Kihlstedt and Bossi’s attitudes are not the only things refreshing about this record. Each song is a true suite in and of itself. You are almost taken aback by the charging and primal “Newsreel,” until you realize that it fits the aesthetics of the band just as well as the introductory creeper, “Curious One.” Both musicians are no stranger to eclectic sounds, as they have worked with similarly inspired musicians like Tom Waits and St. Vincent. However, the craft of the songs here is all their own. They are rich compositions, with both members offering strong and diverse vocal work throughout. Not every song is a diamond, though; tracks like “In the Dead of Night” and “Ballad for No One” ring a little hollow, especially when they are sandwiched between the aforementioned charger, “Newsreel,” and the surreal “Hush Hush.” This being said, even when they don’t hold up quite well as songs per se, there is a sense that the music is just bristling with so many ideas that you can’t outright skip it. A second, third, or tenth listen might just trigger something in you that you hadn’t even thought of yet. That is the true mark of good music, when you it forces you to doubt yourself. For some, Rabbit Rabbit might be a gamble; after all, they are asking for a certain investment and engagement from their listener that is sadly not too commonplace these days. However, what they are banking on (and with good purpose one could say), is that the listener will be rewarded for that investment, and with each new little world that reveals itself, the listener will grow with it. This is a tremendously unique collection of song, and inevitably plays like the music of uniquely tremendous individuals. With a concept and and ethic that screams “making a music album for music album fans,” this is probably the perfect record for someone in your life. It should probably be the perfect record for a lot more too.